How Might The Education and Healthcare Sectors Be (Economically) Alike? Thomas Friedman had an interesting op ed today. He cited a recent McKinsey Study entitled The Economic Impact of the Achievement Gap in America’s Schools. I read his op ed, but thought to take a look at the summary of the McKinsey Study. It points out the potential for huge future improvement opportunity in the educational sector, if only that current opportunity may have been lost. It also discusses an important similarity between the education sector and the health care sector that is worth remark. Our Nation is at risk. Our once unchallenged preeminence in commerce, industry, science, and technological innovation is being overtaken by competitors throughout the world… History is not kind to idlers. The time is long past when American’s destiny was assured simply by an abundance of natural resources and inexhaustible human enthusiasm…We compete with them for international standing and markets, not only with products but also with the ideas of our laboratories and neighborhood workshops. America’s position in the world may once have been reasonably secure with only a few exceptionally well-trained men and women. It is no longer. This McKinsey study asks the question: if we had effectively acted in 1983 and closed the international, racial and class/economic gaps in US k-12 educuation, where would we be today? They stay away from the ‘moral’ and ‘equity’ component of fulfillment of some of the aspects of that old report’s recommendations and keep it at the level of national economic productivity. The answer is that if we had done better, we’d be, as a society, a lot richer. [T]he international achievement gap is imposing on the US economy an invisible yet recurring economic loss [of $1.2T to $2.3T per year] that is greater than the output shortfall in what has been called the worst economic crisis since the Great Depression. In addition, the racial [gap of between $310B to $525B per year], income [gap of $400B to $670B per year], and system achievement gap [of $425B to $700B] all impose annual output shortfalls that are greater than what the nation experienced in the recession of 1981–82, the deepest downturn in the postwar period until now. In other words, the educational achievement gaps in the United States have created the equivalent of a permanent, deep recession in terms of the gap between actual and potential output in the economy. The authors also point out that there seem to be gross inefficiencies in the educational sector. While they do not extend, by analogy, to the health care sector, I’ve seen other studies that could. 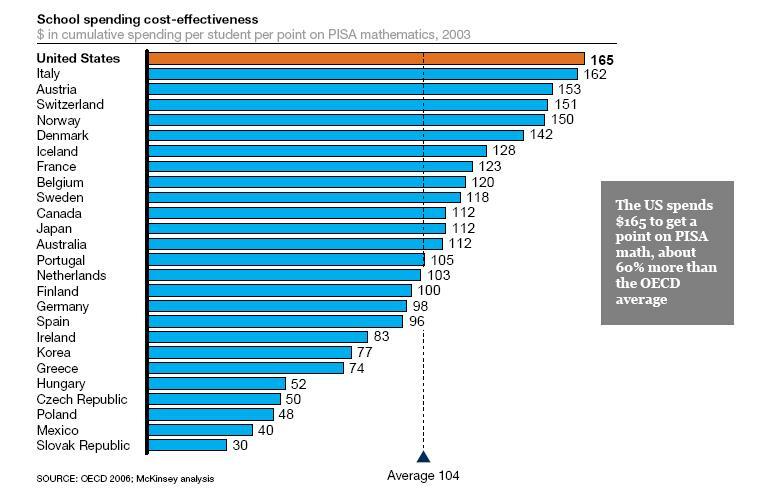 Despite the United State’s very significant per capita education spending, we might have one of the least cost-effective educational systems in the world. 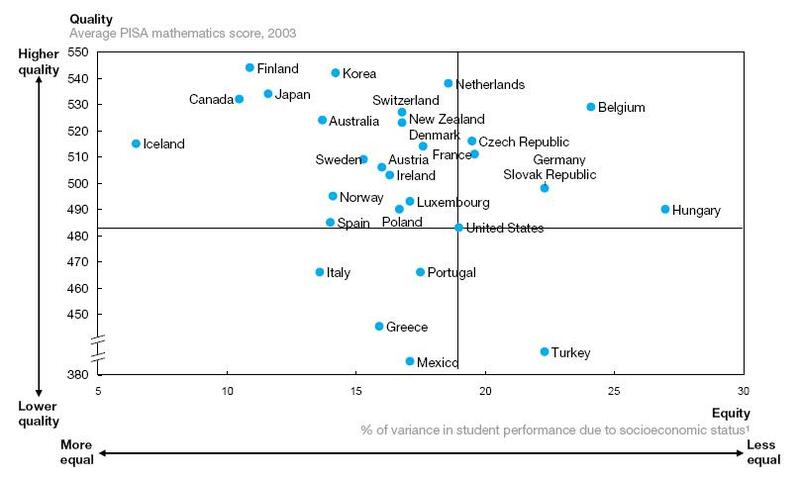 The study authors report that by “one measure we get 60 percent less for our education dollars in terms of average test-score results than do other wealthy nations.” In other words, as the chart from the report shows, we spend more per student to obtain one point on the Program for International Student Assessment (PISA) Math test (2003 data) than any other nation. We pay a lot to perform far less well than our international peers. While the authors do not make very specific recommendations regarding reform, ultimately, their main forward looking conclusion can be summed up by the Lord Kelvin observation: ‘if you cannot measure it, you cannot improve it.’ The corollary — if you can measure it, and use “relentless efforts to benchmark and implement what works[,]” performance can be significantly improved. This is an interesting and sober read and I recommend it.